From the director of Superbad, Adventureland focuses a bit more on the sweet and a bit less on the ridiculous. This is actually a well-written, intelligent character comedy, on that perfectly captures the awkward time that immediately follows college graduation. While few of us have actually held jobs at an amusement park, all of us can relate to that awkward stage where one is supposed to go out and be a man... yet one lacks any and all man-like feelings. The cast is perfect. We knew little about Jesse Eisenberg before seeing him in the main role, but he balances goofy with vulnerable; meanwhile, it's nice to see Kristen Stewart away from the Twilight label, and it's simply nice to see Saturday Night Live stars Bill Hader and Kristen Wiig doing anything. 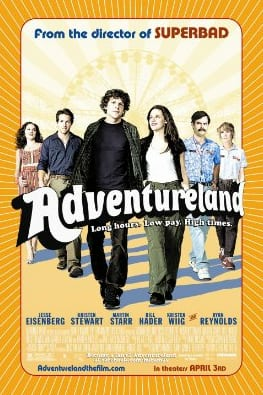 While it sounds like a cliched way to recommend a movie, it rings true: if you liked Superbad, you must go see Adventureland. Don't eat the corn dogs. Permalink: Don't eat the corn dogs.